A Year of Being Here: Robyn Sarah: "An Early Start in Midwinter"
of sickly lights shine pale in kitchen windows. of bacon spitting in a greasy pan. pipes ticked and grumbled like sore bones. The tap runs rust over your chapped hands. Sweep last night's toast-crumbs off the tablecloth. says you are out ahead, with time to spare. Your clothes are waiting folded on the chair. weeks without end. You barely hear the warning. in the dark. And zero floats you into morning. "An Early Start in Midwinter" by Robyn Sarah, from The Touchstone: Poems New & Selected (House of Anansi, 1992). © Robyn Sarah. Reprinted with permission of the poet. 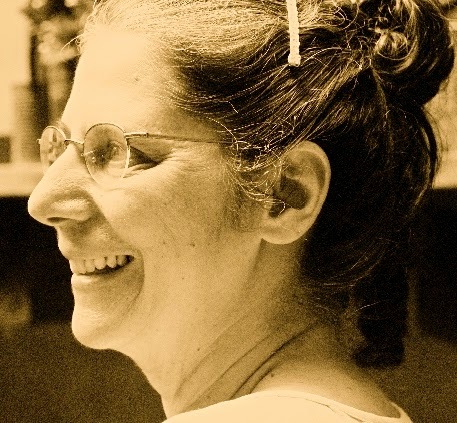 Robyn Sarah’s new poetry collection, My Shoes Are Killing Me, will be published in April 2015 by Biblioasis Press. Biblioasis also published her 2009 collection, Pause for Breath. Poet photograph credit: D. R. Cowles. 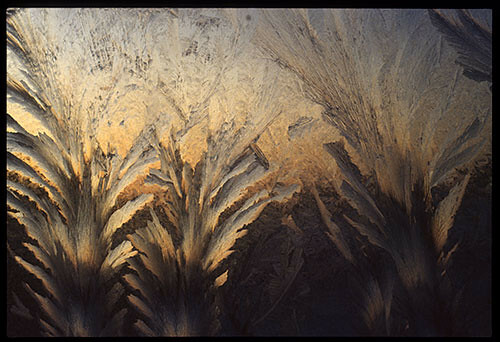 Art credit: "Sunrise Through Window Frost," described as a "scan from an early 1980s Kodachrome 25 slide," by Rob Fillion.